Background/Aim: Mirizzi's syndrome (MS) is an unusual complication of gallstone disease and occurs in approximately 1% of patients with cholelithiasis. Majority of cases are not identified preoperatively, despite the availability of modern imaging techniques. A preoperative diagnosis can forewarn the operating surgeon and avoid bile duct injuries in cases of complicated cholecystitis. 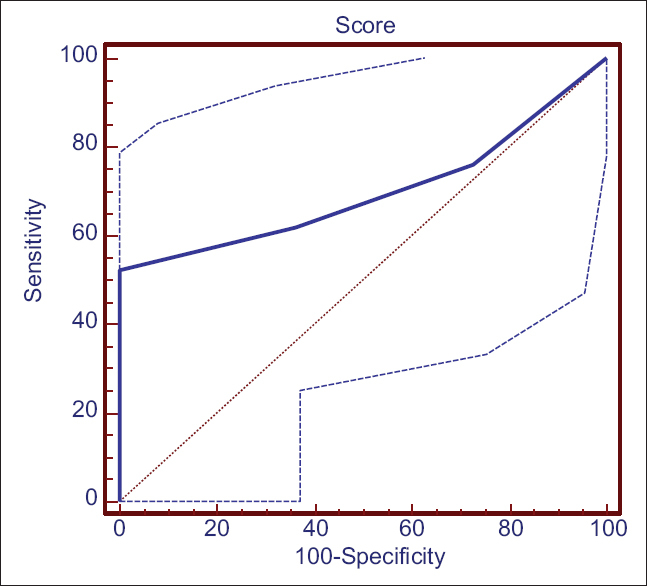 A preoperative scoring system helpful and hence, we aim to devise a scoring system based on clinical, biochemical, and imaging features to predict the diagnosis of MS in cases of complicated cholecystitis. Patients and Methods: From January 2000 to July 2013, 1,539 patients with cholelithiasis underwent cholecystectomy. Of these, 96 patients had complicated cholecystitis. Records of these patients were analyzed retrospectively. In these, 32 patients were found to be having MS that formed the study group. A scoring system was devised based on clinical, biochemical, and imaging parameters to predict the diagnosis of MS. Every positive parameter was given 1 point and patients rated on a scale of 0–10. Results: Score of 3 or more was found to have a 90% sensitivity of predicting MS among complicated cholecystitis. Similarly, a score of 6 or more had an 80% sensitivity of predicting Mirizzi's types II, III, and IV indicating fistulization. Jaundice, leucocytosis, associated choledocholithiasis/hepatolithiasis, intrahepatic biliary radical dilatation, meniscus sign and mass at confluence were found to be significant parameters. Conclusion: We propose a simple scoring system based on clinical, biochemical, and imaging parameters that can be useful for predicting MS in patients with complicated cholecystitis. In 1948, the Argentinean surgeon Pablo Mirizzi, described a patient with partial obstruction of the common hepatic duct (CHD) secondary to impacted biliary stone in the cystic duct or in the infundibulum of the gallbladder, associated with an inflammatory response involving the cystic duct and the CHD. This presentation became known as Mirizzi's syndrome (MS). MS is a rare complication of prolonged cholelithiasis, with prevalence from 0.05% to 2.7% among patients with calculi of the gallbladder., It presents a spectrum that varies from extrinsic compression of the CHD to the presence of cholecystobiliary fistula. For this reason, the disease represents a dangerous alteration in the anatomy during the performance of cholecystectomy, by predisposing the patients to the risk of an inadvertent injury of the CHD., Further, diagnosing MS preoperatively is a challenge despite the availability of various biochemical markers and imaging modalities. The study was done with an objective of minimizing this difficulty by devising a scoring system to predict MS preoperatively and thereby making the surgeon better prepared mentally to avoid complications or helping in an earlier referral of the patient to a higher center. Based upon a thorough literature search in various databases including: Medline, Cochrane, Embase, and Pubmed, the study took into account certain clinical, biochemical, and radiological parameters based on common occurrence that when pooled together can be useful to predict the presence of MS. In this large retrospective, single center study, all laparoscopic or open cholecystectomies performed between January 2000 and July 2013 were identified. Results were obtained by reviewing patients' medical records. A total of 1,539 patient with cholelithiasis underwent cholecystectomy during this period in our hospital. Based upon predetermined criteria for identifying cases of complicated cholecystitis, 96 patients were treated in our hospital during the period January 2000–July 2013, forming the study group. Thirty-two patients of these 96 patients were diagnosed as MS. The study parameters included modes of presentation and duration, relevant biochemical values, imaging modalities, interventions, and treatment. The inclusion criteria were patients between the age of 18 and 80 years, irrespective of gender with complicated cholecystitis. Complicated cholecystitis was defined as patients with acute cholecystitis with diffuse pericholecystic fluid documented on ultrasound examination, empyema formation, gangrenous or emphysematous gallbladder, and spontaneous gallbladder perforation. Patients whose history was not clearly documented or if any discrepancies were found were excluded from the study. Patients diagnosed with malignancy were also excluded. A scoring system was devised based on 10 specific clinical, biochemical, and imaging parameters to predict MS. Every positive parameter was given 1 point. The patients were then rated on a scale of 0–10. The parameters included are detailed below [Table 1]. Historically, MS is a chronic complication of gallstone disease and difficult to diagnose. The pathophysiology of MS usually progresses from a stage of pressure ulcer formation due to impacted gallstone with resultant inflammatory response with edema causing external bile duct obstruction. With chronicity the stone ultimately erodes into the bile duct with different degrees of communication between the gallbladder and the bile/hepatic duct. Most diagnostic modalities take into account these findings during clinical, biochemical, or radiological diagnosis of MS. On literature review, it is commonplace to use a combination of 2 ≥ modalities to diagnose MS. This practice however is not supported by evidence in literature due to lack of consensus among experts. A scoring system including multiple clinical, biochemical, and radiological variables was conceptualized. Clinical parameters: Clinical presentation of MS is nonspecific, but the most common presentation on literature review is obstructive jaundice seen in 60–100% of patients. This is followed by episodes of abdominal pain in right upper quadrant due to biliary colic seen in 50–100% patients.,,,,,, Hence, history of jaundice and more than one episode of abdominal pain were included in the scoring system. Although, in literature almost all authors agree on the chronicity of symptoms, very few papers have discussed on the duration between initiation of symptoms and the time of presentation with MS. Beltran et al. commented that patients with MS have a longstanding gallstone disease with a median of 29.6 years. Similarly, Theegala et al. while studying the association of MS and gallbladder cancer, documented that patients with MS alone have a mean duration of symptoms of 24 months versus 59 months in those having an MS with gallbladder cancer. Based upon this, duration of symptoms of more than 24 months was included as the third clinical parameter. Biochemical parameters: Corresponding with obstructive jaundice, hyperbilirubinemia is the most common laboratory finding. This was followed by leukocytosis and raised alkaline phosphatase levels. Many patients also present with raised aminotransaminase levels.,,,,,,, Hence a total bilirubin value of more than 1.2 mg/dl, the upper limit of normal total bilirubin level was included, followed by the upper limits of normal leucocyte count (11,000 mm 3) and alkaline phosphatase levels (150 U/L) in our laboratory. Radiological parameters: Imaging remains the mainstay in diagnosis of MS. Modalities such as ultrasound, computed tomography, magnetic resonance cholangiopancreatography, endoscopic retrograde cholangiopancreatography (ERCP) as well as intraoperative cholangiogram have all been used to confirm the diagnosis of MS with varying sensitivity and specificity, the highest being for ERCP in the preoperative setup ranging between 55% and 90%., Most of these modalities document presence of biliary stones, proximal ductal dilation, narrowing, or curvilinear extrinsic compression of bile duct or hepatic duct. Calculus impaction at times gives the picture of the classical meniscus sign. Presence of periductal inflammation at times gives an impression of mass at confluence raising suspicion of gallbladder cancer. Hence, stressing more on the radiological signs, four parameters, namely, presence of bile duct or hepatic duct stones, proximal biliary dilatation seen as intrahepatic biliary radical dilatation (IHBRD), meniscus sign, and mass at confluence were included in the scoring system. Each parameter was given a single point to devise a scoring range of 1 to10. The statistical analysis was done using SPSS v16 (SPSS Inc., Chicago, IL, USA). Data were collected retrospectively for all 96 patients of complicated cholecystitis and covered all the parameters mentioned earlier. Baseline data were expressed as frequencies and percentages for categorical characteristics, and the differences in distribution between patients of complicated cholecystitis with MS and without MS were compared using Chi-square tests. The means and standard deviations were used to summarize various variables between complicated cholecystitis patients with and without MS using unpaired t-test. Ordinal regression between “score” as dependent variable and a set of independent variables was also performed. Subgroup analysis was performed on patients with MS with regards to preoperative interventions, operative details, and postoperative interventions and complications to determine risk factors. The study population consisted of 96 patients of complicated cholecystitis of the 1,539 patients who underwent open or laparoscopic cholecystectomy in our institute. Out of these 32 were diagnosed with MS. Females comprised 43.8% (14 of 32) of MS group and there was no gender bias. The mean age was 50.06 years (range 18–77 years). Twenty-one patients were Mirizzi's type I, six patients were type II, four were types III, and one patient was diagnosed as type IV. In complicated cholecystitis without MS (CWMS) group, females comprised 53% (39 of 64) and there was no gender bias. Mean age was 49.72 years. Both groups were comparable without any significant differences. Twenty-eight (87.5%) patients of MS group presented with jaundice, all had abdominal pain, and 18 (56.3%) patients in MS group had fever and 27 (84.4%) on evaluation had leucocytosis. Overall, 13 (40.6%) patients had cholangitis. When compared to 64 patients of CWMS group, patients with MS were more likely to have jaundice, fever, and cholangitis (P< 0.05). Similarly, leukocytosis was seen in 84.4% patients of MS as compared to 26.6% in CWMS (P< 0.001). Radiological “Meniscus sign,” was seen in 53.1% and 1.6% patients and IHBRD in 71.9% and 12.5% patients of MS and CWMS, respectively (P< 0.001). Significant difference was also found in the presence of hepatic or bile duct stones and mass at the confluence (P< 0.01) in the two groups. Patients with MS were also more likely to need preoperative percutaneous transhepatic cholangiogram/drainage or ERCP with stenting. Due to diagnostic dilemma, patients with MS are more likely to have diagnostic laparoscopy before proceeding with a definitive operation. Patients with MS are more likely to be subjected to Hepatico-jejunostomy as well as a T-tube drainage postoperatively (P< 0.001). 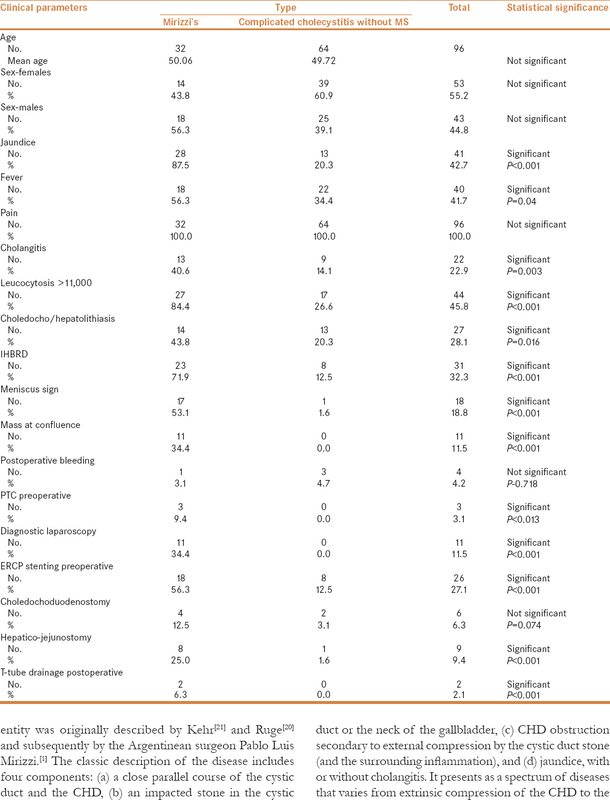 Distribution of patient demographics, clinical parameters, operative, and postoperative parameters are described in [Table 2]. Distribution of various variables in MS and complicated cholecystitis group as well MS are presented in [Figure 1], [Figure 2], [Figure 3]. To check the diagnostic performance of the score, the receiver operating characteristic (ROC) curve comparing patients with or without MS, showed that a score of 3 or more out of 10 showed an area under the curve of 0.914 with 95% CI: 75.0 - 97.9 with a sensitivity of 90.6% and a specificity of 78.1% (P = 0.0001) to predict MS [Figure 2]. Similarly, on subgroup analysis in the 32 patients of MS differentiating them between type I (external compression only) and types II–IV (with fistulization), the ROC curve showed that a score of 6 or more had a high likelihood of predicting types II, III, or IV Mirizzi's, with CI (29.8–74.3) with a sensitivity of 52.4% and a specificity of 100% (P = 0.05) [Figure 3]. MS is defined as bile duct obstruction due to stones impacted in the Hartman's pouch or cystic duct. This entity was originally described by Kehr  and Ruge  and subsequently by the Argentinean surgeon Pablo Luis Mirizzi. The classic description of the disease includes four components: (a) a close parallel course of the cystic duct and the CHD, (b) an impacted stone in the cystic duct or the neck of the gallbladder, (c) CHD obstruction secondary to external compression by the cystic duct stone (and the surrounding inflammation), and (d) jaundice, with or without cholangitis. It presents as a spectrum of diseases that varies from extrinsic compression of the CHD to the presence of a cholecystobiliary fistula. Often, this dangerous alteration to anatomy is not recognized preoperatively and has the potential to lead to significant morbidity and biliary injury, particularly in the laparoscopic era. There are multiple classifications that have been proposed to describe variants of MS, and to aid in selecting the appropriate therapeutic procedure. The original classification, by McSherry et al. described two types. Csendes et al. created a second classification taking into account the extent of fistula. Type I was external compression of the CHD due to a stone impacted at the neck of the gallbladder or at the cystic duct. Type II–IV lesions referred to the presence and extent of a cholecystobiliary (cholecystohepatic or cholecystocholedochal) fistula. When fistula involves less than one third of the circumference of the CHD it is type II, involvement of between one third and two thirds of the circumference is called a type III lesion, while destruction of the entire wall of the CHD was called a type IV lesion. There is another classification, proposed by Nagakawa and colleagues. We used the Csendes classification for our patients. 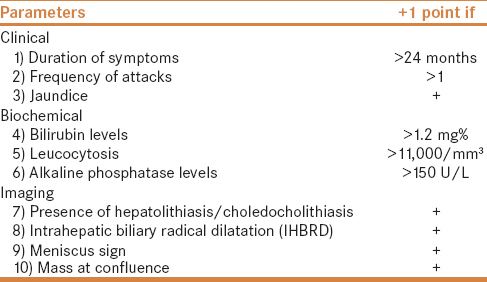 Pain is the most common presenting feature reported in 54–100% of patients followed by jaundice in 24–100% patients and cholangitis in 6–35% patients.,,, Biochemical parameters of liver function show a cholestatic pattern. Serum bilirubin ranges from as high as 30 mg/dl with an average of 7–10 mg/dl. Serum alkaline phosphatase levels range from normal to about 3–10-fold rise.,,, Similar findings were also seen in our study comparing patients of complicated cholecystitis with or without MS. While no statistical difference was found between the incidence of pain in both the groups, patients with MS were more likely to have fever, jaundice and cholangitis clinically (P< 0.05). A leucocyte count of >11,000 was seen in 84.4% patients of MS as compared to 26.6% in those without MS (P< 0.001). Mass at the confluence was seen in 34.4% patients of MS and all of these patients were subjected to diagnostic laparoscopy to confirm the diagnosis and rule out malignancy. None of the patients without MS had this sign (P< 0.001). This is an important finding as MS is known to be associated with cancer in up to 27% of cases. Traditionally, MS is managed by surgery, which involves cholecystectomy and management of fistula, if present, it can be a real challenge. The surgical strategy needs to be based on basic principles of removal of gallbladder and the obstructing stone, restoration of biliary tree integrity and in some cases closure of the gastrointestinal tract defect. Laparoscopic management can be attempted particularly in type I MS, keeping a very low threshold for conversion which on literature review varies between 31.7% and 100%., Between 8% and 25% patients may need repair of biliary tract fistulization of the bile duct. In our study, four patients of MS and two patients without MS needed choledocho-duodenostomy and 25% patients of MS needed repair of the fistula with hepatico-jejunostomy compared to none in patients without MS (P< 0.001). These procedures need advanced skills, experienced team as well as a hospital setting. Inadequate recognition of MS leads to high perioperative morbidity and mortality. An early and accurate diagnosis is known to reduce both morbidity and mortality and helps prevent future complications by 54%.,,,, Hence it is paramount to diagnose or keep a high index of suspicion for MS preoperatively. Most clinicians prefer using two or more diagnostic modalities when MS is suspected, though this is not supported by strong evidence. There is a lack of consensus among experts regarding the best practice to be followed. Keeping in mind this lack of consensus and the various common features seen in MS, we feel that a scoring system devised using multiple parameters may help predictability of this entity that has myriad of presentations, sometimes so complex that one may have to exclude malignancy. Our score included 10 parameters—biochemical, clinical, and imaging, which when applied to the 64 patients of complicated cholecystitis and 32 patients of MS, studied over a period more than 12 years, were found to be significant to predict the diagnosis of MS. When applied to patients of complicated cholecystitis with or without MS, it was found that patients with MS have a mean score of 6.72 as compared to 2.08 in patients without MS (P< 0.001). Out of these 10 parameters, prolonged duration of the disease, multiple attacks with in between remission, leucocytosis, associated calculi in the biliary tract, meniscus sign on imaging and mass at the confluence, that is, junction of cystic duct with the hepatic duct were the ones that made a significant difference to the score (P< 0.05). The differences between the variables included in the scoring system between the two groups have been explained in [Table 3]. When used prospectively to assess patients with complicated cholecystitis, the score may help a physician or surgeon to refer the patient to a high-volume tertiary level specialty care center with more experience and expertise in handling such situations. Alternatively, this score can also be used to decide the need to get the bile duct imaged. Trying to operate in such conditions and unfamiliar anatomy because of the inflammatory process, by young surgeons, without adequate expertise and experience, can lead to catastrophic complications, namely, bile duct injuries, bile leak or major vessel injury with its resultant morbidity and mortality. The social and economic impact of bile duct injury on the patient is significant. In a developing country like India with a vast population, our health-care resources are already stretched. Bile duct injuries and its resultant morbidity and mortality apart from affecting the patient socially and economically, also imparts a significant health-care cost. By using a preoperative scoring system, we can anticipate and prevent such injuries and do a timely referral to a high-volume tertiary care center. This is a retrospective single center study and therefore caution should be exercised while interpreting the results. As the data of the clinical events was recorded retrospectively by reviewing medical records, we cannot rule out reporting and observer bias. There is a high likelihood that few patients with type I MS might not have been recognized by the operative team and hence may result in under-reporting of a few cases. We also understand that it is premature to generalize our findings to other parts of India, as the study includes patients only from a single center in a single city. Further randomized control trials, prospective case matched cohort studies or double blind prospective studies with larger patient group would be required to validate the scoring system and our findings. However, definitive comparison and prospective randomized control trials may be difficult in the clinical setting because of heterogeneity in case-mix as well as the rare occurrence of MS. The scoring system should in no way replace standard protocols used to evaluate and diagnose patients with gallstones and its associated complications. 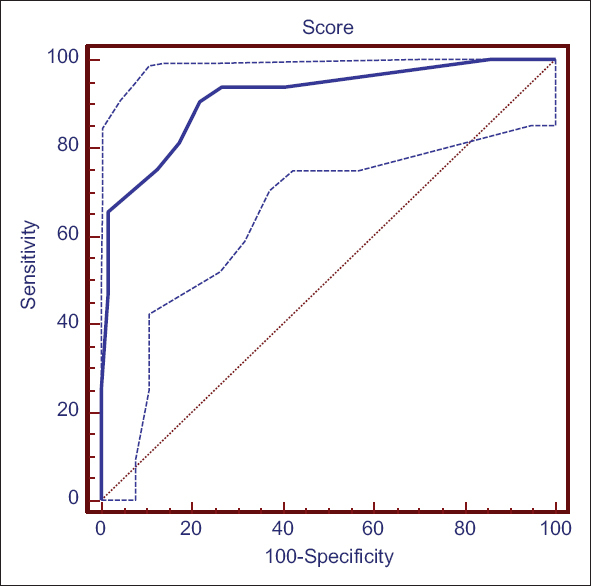 This scoring system can be used to predict MS, and a higher score can also predict cholecysto-choledochal fistulization. Application of such a scoring system may help in forewarning the surgeon, facilitate early referral of such patients to higher centers if necessary and avoid bile duct injuries with long-term morbidity and reduce costs. Also, in the present scenario with increasing number of complicated surgeries being done with minimal access techniques this may help in anticipating early conversions and avoiding biliary injuries. Mirizzi PL. Syndrome del conducto hepatico. J Int Chir 1948;8:731-77. Johnson LW, Sehon JK, Lee WC, Zibari GB, McDonald JC. Mirizzi syndrome: Experience from a multi-institutional review. Am Surg 2001;67:11-4. Karakoyunlar O, Sivrel E, Koc O, Denecli AG. Mirizzi syndrome must be ruled out in the differential diagnosis of any patients with obstructive jaundice. Hepatogastroenterology 1999;46:2178-82. Martin RF, Rossi RL. Bile duct injuries. Spectrum, mechanism of injury, and their prevention. Surg Clin North Am 1994;74:781-803. Pemberton M, Wells AD. The Mirizzi syndrome. Postgrad Med J 1997;73:487-90. Piccinni G, Sciusco A, De Luca GM, Gurrado A, Pasculli A, Testini M. Minimally invasive treatment of Mirizzi's syndrome: Is there a safe way? Report of a case series. Ann Hepatol 2014;13:558-64. Abou-Saif A, Al-Kawas FH. Complications of gallstone disease: Mirizzi syndrome, cholecystocholedochal fistula, and gallstone ileus. Am J Gastroenterol 2002;97:249-54. Lai EC, Lau WY. Mirizzi syndrome: History, present and future development. ANZ J Surg 2006;76:251-7. Bower TC, Nagorney DM. Mirizzi syndrome. HPB Surg 1988;1:67-74; discussion 75-6. Al-Akeely MH, Alam MK, Bismar HA, Khalid K, Al-Teimi I, Al-Dossary NF. Mirizzi syndrome: Ten years experience from a teaching hospital in Riyadh. World J Surg 2005;29:1687-92. Kelly MD. Acute Mirizzi syndrome. JSLS 2009;13:104-9. Yip AW, Chow WC, Chan J, Lam KH. Mirizzi syndrome with cholecystocholedochal fistula: Preoperative diagnosis and management. Surgery 1992;111:335-8. Beltran MA, Csendes A, Cruces KS. The relationship of Mirizzi syndrome and cholecystoenteric fistula: Validation of a modified classification. World J Surg 2008;32:2237-43. Prasad TLVD, Kumar A, Sikora SS, Saxena R, Kapoor V. Mirizzi syndrome and gallbladder cancer. J Hepatobiliary Pancreat Surg 2006;13:323-6. Lubbers EJ. Mirizzi syndrome. World J Surg 1983;7:780-5. Safioleas M, Stamatakos M, Safioleas P, Smyrnis A, Revenas C, Safioleas C. Mirizzi Syndrome: An unexpected problem of cholelithiasis. Our experience with 27 cases. Int Semin Surg Oncol 2008;5:12. Zaliekas J, Munson JL. Complications of gallstones: The Mirizzi syndrome, gallstone ileus, gallstone pancreatitis, complications of “lost” gallstones. Surg Clin North Am 2008;88:1345-68. 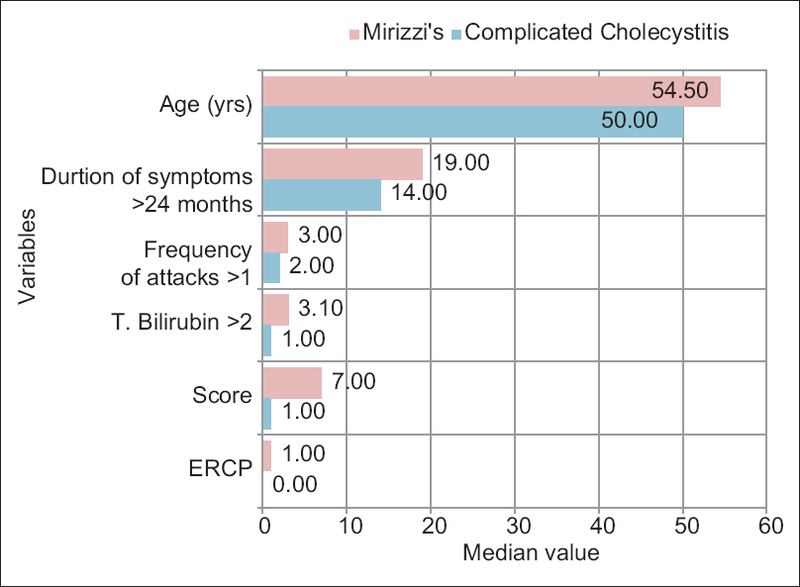 Yonetci N, Kutluana U, Yilmaz M, Sungurtekin U, Tekin K. The incidence of Mirizzi syndrome in patients undergoing endoscopic retrograde cholangiopancreatography. Hepatobiliary Pancreat Dis Int 2008;7:520-4. Ruge E. Deitrage zur chirurgischen Anotomie der grossen Gallenwege (Ductus Hepaticus, choledochous und pancreaticus). Arch Clin Chir 1908;78:47. Kehr H. Die in neiner klinik geubte technik de gallenstein operationen, mit einen hinweis auf die indikationen und die dauerersolge. Munchen: JF Lehman; 1905. McSherry CK, Ferstenberg H, Virshup M. The Mirizzi's Syndrome: Suggested classification and surgical therapy. Surg Gastroenterol 1982;1:219-25. Csendes A, Diaz JC, Burdiles P, Maluenda F, Nava O. Mirizzi's syndrome and cholecystobiliary fistula: A unifying classification. Br J Surg 1989;76:1139-43. Nagakawa T, Ohta T, Kayahara M, Ueno K, Konishi I, Sanada H. A new classification of Mirizzi syndrome from diagnostic and therapeutic viewpoints. Hepatogastroenterology 1997;44:63-7. Mishra MC, Vashishtha S, Tandon R. Bilio-biliary fistula: Pre-operative diagnosis and management implications. Surgery1990;108:835-9. Lakhtakia S, Gupta R, Tandan M, Rao GV, Reddy DN. Mirizzi's syndrome: EUS appearance. Gastrointest Endosc 2006;63:322-3. Callery MP, Strasberg SM, Doherty GM, Soper NJ, Norton JA. Staging laparoscopy with laparoscopic ultrasonography: Optimizing resectability in hepatobiliary and pancreatic malignancy. J Am Coll Surg 1997;185:33-9. Baer HU, Matthews JB, Schweizer WP, Gertsch P, Blumgart LH. Management of the Mirizzi syndrome and the surgical implications of cholecystcholedochal fistula. Br J Surg 1990;77:743-5. Becker CD, Grossholz M, Mentha G, de Peyer R, Terrier F. MR cholangiopancreatography: Technique, potential indications, and diagnostic features of benign, postoperative, and malignant conditions. Eur Radiol 1997;7:865-74. Waisberg J, Corona A, de Abreu IW, Farah JFM, Lupinacci RA, Goffi FS. Benign Obstruction of the Common Hepatic Duct (Mirizzi Syndrome): Diagnosis and operative management. Arq Gastroenterol 2005;42:13-8. Ibrarullah, M, Saxena R, Sikora SS, Kapoor VK, Saraswat VA, Kaushik SP. Mirizzi's syndrome: Identification and management strategy. Aust N Z J Surg 1993;63:802-6. Binmoellar KF, Thonke F, Soehendra N. Endoscopic treatment of Mirizzi syndrome. Gastrointest Endosc 1993;39:532-6. Redaelli CA, Büchler MW, Schilling MK, Krähenbühl L, Ruchti C, Blumgart LH,et al. High coincidence of Mirizzi syndrome and gallbladder carcinoma. Surgery 1997;121:58-63. Yeh CN, Jan YY, Chen MF. Laparoscopic treatment for Mirizzi syndrome. Surg Endosc 2003;17:1573-8. Schäfer M, Schneiter R, Krähenbühl L. Incidence and management of Mirizzi syndrome during laparoscopic cholecystectomy. Surg Endosc 2003;17:1186-90; discussion 1191-2. Antoniou SA, Antoniou GA, Makridis C. Laparoscopic treatment of Mirizzi syndrome: A systematic review. Surg Endosc 2010;24:33-9. Beltrán MA, Csendes A. Mirizzi syndrome and gallstone ileus: An unusual presentation of gallstone disease. J Gastrointest Surg 2005;9:686-9. Leopardi LN, Maddern GJ. Pablo Luis Mirizzi: The man behind the syndrome. ANZ J Surg 2007;77:1062-4. Levrat M, Chayvialle P. Les calcules de l'extremite inferieure du cystique a symptomatologie choledocienne par compression de la voie biliaire principale. J Med Lyon 1941;26:455-9.